This post has absolutely nothing to do with my high school reunion at the end of this month. It’s not about me, it’s you, my lovely friend (you know who you are) who took me to her ‘school reunion’ when Scouting for Girls came to Birmingham on tour. Yes, my friend went to school with the lead singer Roy and the bassist Greg and she was on the guest list when they came to play the O2 Birmingham last night. With four tickets she invited me along with my husband Phil and our our son. Now he’s going to hate me for this but not only was it the first ever gig my son has been to, it turns out the first album he bought was Scouting for Girls. I didn’t know that until last night. And now Roy (see first name terms now) knows it too as my friend told him. And get this, we had these wrist bands. 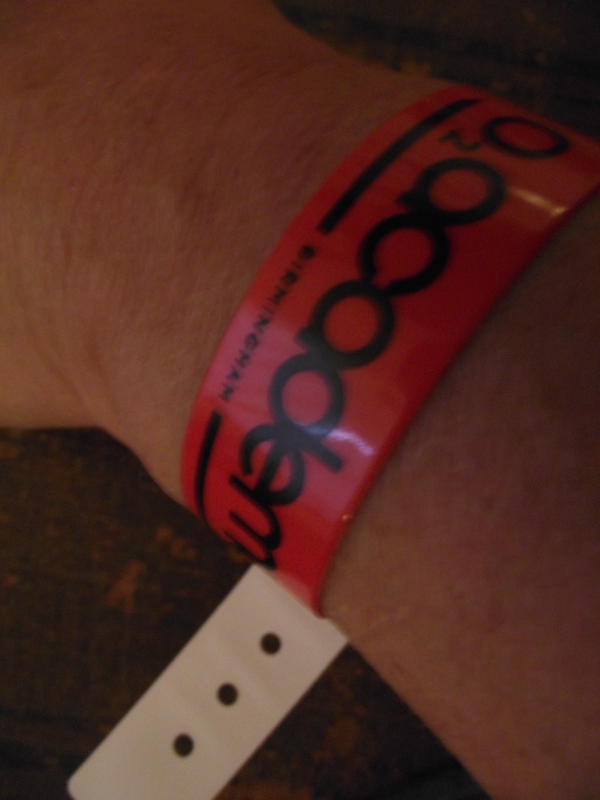 My friend, for whom this is not a first time experience was like ‘well it is not that much you just get to meet the band’, and I am like OMG I have a wrist band. I didn’t say that of course, I am a fifty something sensible wife and mother but actually I was very excited about it. Usually on a week day I am half watching a cookery programme while updating my Facebook status. We were going to the back stage party! Well not exactly but we did get to meet her mates later. And it was all very civilised. Before the gig we met at Cherry Reds in John Bright Street. It was a freezing night and, even at 6pm, very few people were lingering for shopping eating or drinking in the German Market. Everyone was rushing to get home it was so cold. Cherry Reds however was quite busy. It is strategically placed for when Grand Central opens in 2015. The long needed overhaul of New Street Station will include a new retail development with a flagship John Lewis store. Over a few drinks, we decided that when it was finished this quarter of Birmingham would be the retail destination of choice, as John Bright Street will be the. Gateway from Grand Central to the Mailbox where Harvey Nics is, leaving the Bullring to the cashed up Bogans and Wags. Cherry Reds is directly opposite Brew Dog, a bar providing a range of craft beers and food in, according to their website, a temple of non conformity. It was empty on this bitter Tuesday evening. Cleary all the non conformists were elsewhere. Cherry Reds is a licensed cafe, with an eclectic mix of vintage sofas and formica tables it sells all day food, smoothly moving from hipster central for Saturday brunch to a place to take mom for Sunday lunch. Its close proximity to the station, the Mailbox, The Electric Cinema and theatres including the Hippodrome, the Alex and The Rep makes it a good choice for pre theatre coffee, supper and drinks. It is also close to the O2 where we were off to later. Did I say I went to see Scouting for Girls there? The food is hearty British, between us we had a pork burger with chorizo, gammon, eggs and chips, fish pie and bangers and mash, and there are lots of veggie options. We were downstairs and it was a bit cold when people opened the door, but every table was full, enjoying laid back post work drinks or supper with friends. Upstairs was quieter and would be my choice for later drinks on the sofa. People watching. Definitely better than freezing in the German market. We filled up on good food, good beer and good milk shakes and ventured to the sub zero temperatures to the O2. The support band were, Loveable Rogues who were on stage when we arrived. I am no muso journo and I make no claims of knowing half the bands my friends like, or even what genre of music they are but I thought they were they were good. I had no idea what genre they are but Wikipedia tells me they are indie pop and that they were hand picked to be on Britain’s Got Talent. For the main act we decided to go on the balcony for what was a better view of the stage without having to stand with the young people who jump up and down at concerts. Phil and I were not (surprisingly) the oldest at the gig. Some parents had brought quite young children (under 11) and there were 20 to 50 something couples as well as teeny boppers or whatever they are called now with bored chaperones. The band were good. They put on an entertaining show, engaged the audience and nearly everyone in the room knew most of the lyrics. And for those of you who turned down free tickets as they are not a ‘cool band’, well thank you because I loved it. The highlight for me was the acoustic set. Bringing the instruments to front of stage they played a brilliant set. It was very intimate (as much as the O2 could be) almost like being at pub gig with just mates in the room. Brilliant. Of course the night is not complete IMHO without the Michaela Strachan number and She’s So Lovely. At one point Roy came up to the balcony to sing, and brilliantly had to pass our and his friend so to the chagrin of the teeny boppers standing next to us, gives her a bear hug and greets her by name. Their faces we’re a picture, imagine envy mixed with bewilderment aka ‘why has he chosen her she’s really old why her and not us lithe teenage fans?’ Just as most 12 years old think that anyone over 20 is over the hill. Here’s the news guys, Roy’s the same age as my friend. And she’s not old, just older than you 13 year old teeny bopper and one day you will be that age. I guess one can be grateful that they were at his gig and not at One Direction. Not that there is any connection between the two bands. Of course not. None at all. Nada. None whatsoever. Nothing to see here. Finally it came to meeting the band. And after just chatting to family, with the fan club girlies with double lip gloss waiting patiently, and me wanting my bed, my friend drags Roy over to introduce him to us. Clearly as we are not friends of her age, but a family consisting of 50 something’s and a 20 something, the ‘how do you know each other’ question arises. ‘Mary Portas introduced us’. Well that would have been the clever, and true if somewhat embellished answer, instead is was more ‘eh um, we all live in Bearwood, and um xxxx stayed with us during house renovations’ sounds less interesting when talking to the lead sing of Scouting for Girls. Ho hum. He chatted to us about record deals and reveals that he also does a lot of writing for other bands. ‘She’s So Lovely’ may be his pension but hey he has to make a living, so writing for boys with floppy hair pays the bills. ‘ They’re just kids’, he says genuinely kindly, to me who today discovered said boys on a toothpaste tube and was less kind about them. He is the bigger person for that then. And richer. But he is genuinely an ok guy without ego, he keeps that for the stage. Not that I would expect any less from a friend of my friend. And anyway she knows too much about him for him to be anything other than just who he is. Then Greg comes over and shows us a picture of his dog a Cocker doodle doo pug something cross that looks like a lab puppy, always. In my day they were called mongrels, now cross breeds have designer status. Equal rights for dogs. He gets told off for doing the rock star hand gesture, teased that he’s in a pop band and cannot get away with it. He then lists his rock credentials and is grudgingly acknowledged by his old school friend that they are indie rock. Not pop. Chats about old school mates and who is married and who has 5 kids. Just like any other high school reunion then? Again she’s known him too long for him to act anything more than an old school friend and egos have been packed away by the roadies with the guitars. We are tired, it’s a school night and they need to schmooze and smile at the lip glossed girls so off into the cold night and despite trying to be really nonchalant about meeting Scouting for Girls, we are all a bit star struck. Well I am. And I think my friend, despite saying its hard to find people to come when she gets comps, is too. All I can say don’t be a music snob. Because you may miss out on a good night out. Thank you for taking us, mate. This entry was posted in Community, Food, Music and tagged Birmingham, Cherry Reds, Class reunion, Facebook, High school, Loveable Rogues, Mailbox, Mary Portas, Michaela Strachan, Scouting for Girls by Travelling Coral. Bookmark the permalink. Definitely agree with not being a music snob! People laugh about me liking bands like Thirty Seconds To Mars and Paramore because they are “mainstream” and play stadium gigs and lots of young(er) people like them! But do I feel moved by the music and have an ace time when I see them live? Yes! And that feels a lot nicer than the mediocre feeling of listening to “cool” music that I don’t like as much! Katie, no idea who Thirty Seconds to Mars are but discovered Spotify today so will ‘check’ them out and by the way it was The Thrills we saw at The Academy. So I am informed. And thanks for your comment, no one should laugh at anyone who likes different bands, ever. ish. Haha a Cocker doodle doo pug something cross that looks like a lab puppy – i want one! I definitely don’t listen to ‘cool’ music and can never ever sing along with the things i’m supposed to know the words to… only kooky weird stuff that nobody has heard of. Life’s just too short to catch up on all the boring ‘shoulds’ and trends!